The doctors will tell you the risk of miscarriage is between 15-20% of all pregnancies. When we got dealt the hand of miscarriage, I felt my body had failed me, despite knowing these odds. I was angry. I was emotional. I blamed myself for being too active, not active enough, too old, too young, too insecure, overconfident, you name it. I questioned God’s kindness, plan, and even existence at various points in the healing process. I searched for support groups relevant to my situation, but I was afraid to talk about it with too many people, so I had trouble finding the right group. I had friends who had previously lost babies at full term, so I felt my grief paled in comparison to theirs and thus I kept silent so as not to offend them. It was hard, and it took me months to find my new “normal.” I often felt alone with my thoughts. As I came to grips with the fact that my body had not necessarily failed me (and therefore I could stop blaming myself for drinking too much coffee or running that half marathon or walking through Snowmageddon or not drinking enough water), I learned to process my grief as part of my story. I still don’t know why it happened, but I know God is faithful and that He will ultimately use it for His glory. I longed for the baby we lost but I know that we wouldn’t have our sweet girl had that miscarriage not happened. That was ultimately what I chose to focus on, and I thanked God daily for His choice to allow another pregnancy. I wrestled with guilt/anxiety/sadness during my entire pregnancy with Claire, because I had the miscarriage as my only frame of reference. It was nerve-wracking. 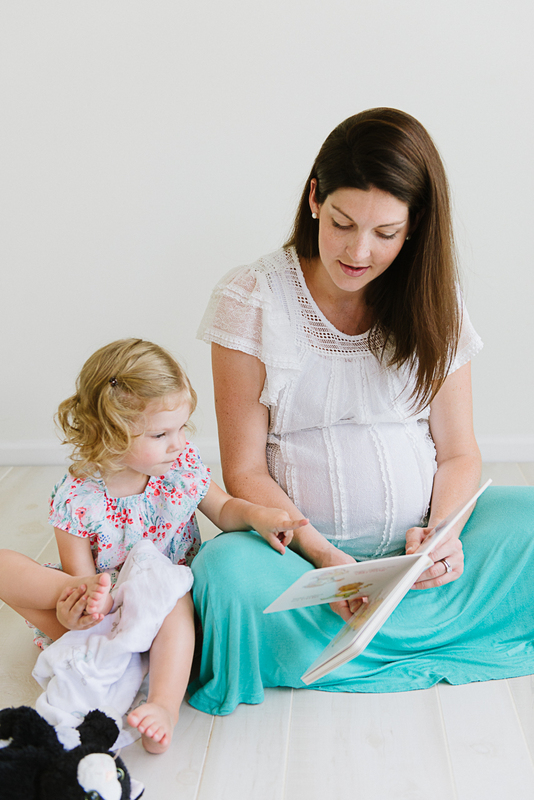 I was torn between the fear of another loss (in my mind another loss or a loss later into pregnancy would have been even worse, and I wasn’t sure how I could bear it), and the guilt of not being able to fully enjoy her pregnancy. My mother in law gave me this book, which proved to be extremely helpful in processing my grief and helping me find practical steps to move on. I needed something tangible to focus on, and reading was a tremendously helpful outlet. I could consume information without perseverating over my own situation. People say well-intended but insanely unhelpful things in times of grief, or at hearing sad news. I realized through my own grief that I’d been so guilty of those things myself. It was a lesson in humility and grace for me. I found this post from another blogger when I was processing my miscarriage. Her story was so similar to my heart’s cry, and her deep convictions and faith in God helped me see hope. I was grieving a child I wanted but never got the chance to meet. People say things, well meaning things, to try to give you hope: “you’ll get pregnant again,” that kind of thing. Obviously I wanted that to be true, but it wasn’t just that I was sad about not being pregnant; I was sad about the baby I wanted and lost. At the end of the day, I believed God would grant us a child in His timing. But, the takehome point of her post was that even if He does not He is still God and worthy to be praised. I hope to have the courage to write out more specific details of my miscarriage because, as her story gave me hope, I hope it will bring someone else hope. I’m still learning how to process my loss. I’m certain I’ll be writing about this more as I grow and heal. In the mean time, I’ve learned that God gives. Nothing happens outside of His sovereign will. I don’t believe He caused my miscarriage. I don’t believe He was correcting a mistake. I do believe He knew and allowed it to happen. He has some greater good to show me through this, and that somehow it will bring Him glory. I’m not God, but I’m getting to know Him a little more each day. He doesn’t owe me anything, but I owe Him everything. I am so grateful to Him for our two healthy girls. I would love more kids, but I don’t know if that is His plan for us. Right now, my goal is to be appreciative of what I do have, cling to Him for the things I don’t, and try to provide hope, fellowship, and camaraderie for others along the journey. 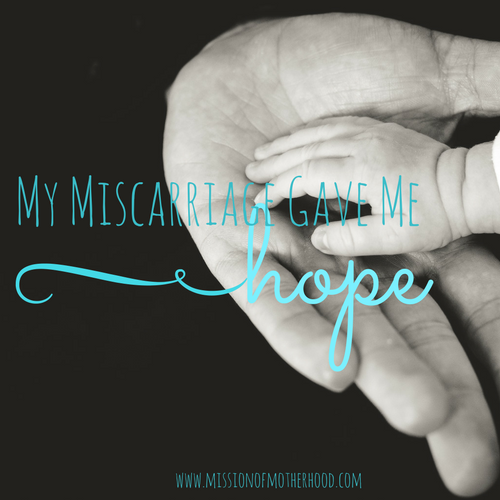 It’s been years, but I’m finally able to say: my miscarriage gave me hope. Not necessarily hope for more babies (though that was also the case, and yes I absolutely hoped for that) but a bigger hope for a brighter future, hope in heaven, and hope that kept my faith. Even if He does not grant me the things I want, I have hope that He is still the God who provides and heaven is a happy place. I learned as I grew closer to God that He changed my desires. I had more of a desire to do His will and less of a desire to seek Him to fulfill my own desires. In experiencing, healing from, processing, sharing, and moving past my miscarriage I learned about a support group called M.E.N.D. There is no local chapter of this group, but in the last few years it’s come up a few times in my searches. Since having our second, another friend lost a full term baby, and I realized I wanted to be able to provide more for a mother grieving a pregnancy loss than just “me, too.” I recently contacted the director, and am in the process of filling out the application to open a chapter here, in North Carolina. This is no small task, and it’s a bit scary. It’s a lot of responsibility, and I’m not sure what God’s plan is for me in this. I’m taking it one day at a time–I’ve got two kids to care for, and I want to be obedient to those responsibilities too, even in my desire to help other bereaved mothers. It requires a financial commitment (raised by support or donations), co-leaders, and extensive training (as you can imagine). I’m trusting God’s plan and timing for this. He’s in the small details! Do You Ever Feel Like You're Faking It?